Subscribe to receive full access to Jeannie's fine wine notes and commentary. Very few people in the world have access to the rare, unique fine wines that Jeannie is able to taste on a regular basis. Find out how the finest wines from around the world are tasting today. Asian Palate won the Gourmand Award’s Best Food and Wine Pairing book in the World against nearly 6,000 other books from 136 countries in 2009. It has also won the International Association of Culinary Professionals (IACP) Award under the ‘Wine, Beer or Spirits’ category and the Organisation Internationale de la Vigne et du Vin (OIV) Award under the ‘Wine and Gastronomy’ category in 2011. It was also short-listed as one of four books considered for the Andre Simon Award. This award-winning book is priced at US$98 + shipping costs, available to order directly through the link below, as well as through Amazon U.S., Amazon U.K. and in Hong Kong from Watson's Wine Cellar stores, Ponti Food and Wine Cellar stores, Grand Hyatt Hong Kong Lobby Shop, Grappa's Cellar Jardine House and selected fine book stores in Hong Kong including Dymocks, PageOne, Kelly & Walsh, Swindon Bookstores and Hong Kong Book Centre. For Simplified Chinese version，please click here. Mastering Wine for the Asian Palate is priced at US$88 + shipping costs, available to order directly through the link below, as well as through Amazon U.S., Amazon U.K., in Macau from Galaxy Collections Shop, in Australia from Crow Books and in Hong Kong from Watson's Wine Cellar stores, and selected fine book stores in Hong Kong including Dymocks, PageOne, Kelly & Walsh,Bookazine, Swindon Bookstores and Hong Kong Book Centre. 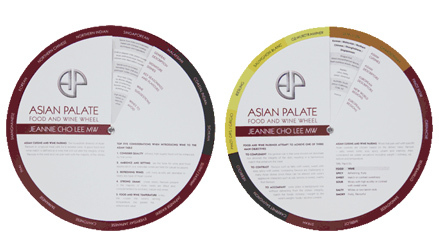 Whether it is a Chinese, Thai, Taiwanese or Japanese meal, this handy food and wine wheel can help you pair fourteen different types of cuisines with wine. It recommends which wines complement local flavours and which wines to avoid. Flip it over and find fourteen different grape varieties, with Asian descriptions, European descriptors and complimentary Asian cuisines. The mission was to create the most versatile, useful and beautiful wine glasses. After three years of research and exploration, Jeannie is proud to bring you three designs, each named after the temperature in which the wines for each glass should be served, and two universal, functional glasses. To find out more about the glasses and download the brochure, click here. To place an order, email or Call +852 2415 9288.